Color-coding is a big help when identifying individual fibers, cable, and connectors. For example, cable jacket color typically defines the fiber type, and can differ based on mode and performance level. These colors are typically chosen by industry standards bodies. However, there are some non-standardized colors and inconsistencies that you should be aware of. Let’s take a closer look at the colors for multimode fiber types. If the fiber cable in your network is orange, it is likely OM1. However, there is some legacy orange cable that was available before the OM1 specification. This early cable has a modal bandwidth of 160 MHz.km @ 850 nm, as opposed to 200 for OM1. If you encounter orange cable that is not marked OM1, you may need to assume the cable is 160 MHz.km, limiting 10GBASE-SR to just 26 m (85 ft.). OM2 is 50 micron fiber, which provides a much better modal bandwidth than OM1, 500 MHz.km @ 850 nm. The industry standard color for OM2 is grey. However, there are some early OM2 cable installed that is orange, so always check the markings to make sure. Both laser-optimized OM3 and OM4 cable is aqua, as TIA and ISO did not introduce a new color for OM4. However, some manufacturers introduced the color violet to designate OM4 (including Leviton). This color designation is important to differentiate the two types, as the modal bandwidth of OM4 (4,700 MHz.km @ 850 nm) is significantly better than OM3 (2,000 MHz.km @ 850 nm). Lime OM5 cable was approved by TIA and ISO in 2017. Note in the chart above that OM5 has the same modal bandwidth as OM4 @ 850 nm. 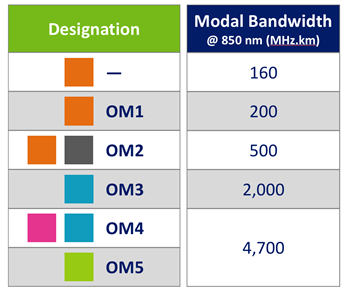 The main difference between the two options is that OM5 is designed specifically to handle Short Wave Division Multiplexing, which transmits four channels on one duplex multimode fiber pair between 850 nm and 953 nm. However, for all existing IEEE applications, there is no current advantage of OM5 over OM4. A reminder: while multimode fiber comes in either 50 micron or 62.5 micron core size, the ANSI/TIA-568.0-D standard recommends 850 nm laser-optimized 50/125 micron be installed as the multimode fiber for new structured cabling designs. This includes both OM3 and OM4 classifications to support 10 Gigabit Ethernet and possibly provide a migration plan to support future 40 and 100 Gigabit applications. Both OM1 (62.5/125 micron) and OM2 (50/125 micron) classifications are now considered legacy fiber types. Get a thorough overview of current and forward-looking fiber solutions, including fiber types, connector and termination options, and future applications, with our on-demand webinar Demystifying Enterprise Fiber Networks.